Knight staff members Alyssa Hollenkamp, Natalie Horstmann, and Paris Hempen place various items into the last care package to be sent to Marines serving in Afghanistan. As its service project, the yearbook staff collected items that were boxed and mailed overseas. 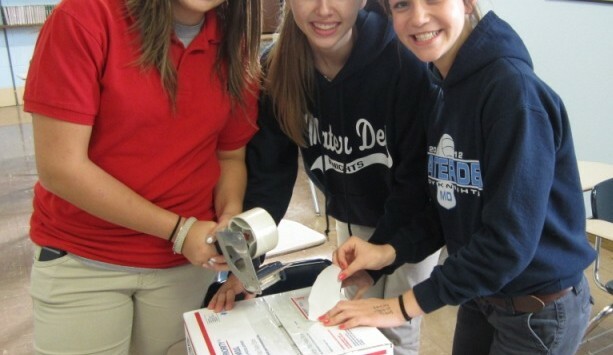 The Knight (yearbook) staff recently completed a service project when it packaged items to send to a soldier, Sgt. Matt Copus, who is serving a tour of duty in the chilly mountains of Afghanistan. As Mater Dei strives to help others, the Knight staff, along with the freshman class, brought items such as magazines, snack foods, hand warmers, and various toiletries for Sgt. Copus and his platoon. In an overwhelming response, student brought in more than enough items to fill 14 boxes that were shipped overseas. Furthermore, the yearbook members held a Halloween candy bar fundraiser to help defray the costs of mailing these care packages to our country’s heroes.